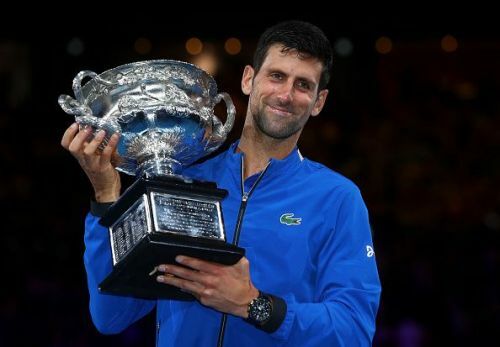 Novak Djokovic produced a tennis masterclass in the final of the 2019 Australian Open when he defeated Rafael Nadal in straight sets in just over two hours to capture a record-breaking 7th Norman Brookes Challenge Cup, moving ahead of Roger Federer and Australian great Roy Emerson. The Serb was imperious from the get go, losing just one point on serve in the first set. He set the tone for a dominant 6-3, 6-2, 6-3 win over his great rival in their historic 53rd meeting. The World No.1 has now triumphed in his third successive Grand Slam since returning from elbow surgery. With that victory, a few stats spring to mind. Djokovic has won three successive Grand Slams for the third time in his career (2011-12, 2015-16, 2018-19). He is also on course to hold all four Slams at the same time for the second time in his career if he can manage to dethrone the Spaniard at Roland Garros this year. Djokovic’s seventh Australian Open title now moves him ahead of Pete Sampras to 15 Grand Slam singles crowns and now the Big Three occupy the top three spots as the players with the most titles. The Serbian superstar is now two Slams behind Nadal and five behind Roger Federer who is top of the leaderboard with 20. However, the manner of Djokovic’s domineering victory has raised a few subplots on whether the man from Belgrade will eventually pass Roger Federer’s 20 titles. That, in essence, will depend on a number of factors, not least Djokovic’s fitness which up to this point of his career, has been excellent. There is the famous saying in tennis, never write off Roger Federer. For the most part of his career, the Swiss has defied the odds on more than one occasion. Federer won three Grand Slams in the space of 12 months after enduring a 5-year drought without Major success. His two Australian Opens and Wimbledon in the last two years came after he returned from a knee injury. However, Djokovic’s absence during Federer’s coronation has been massively played down. While taking nothing away from the legendary Swiss, his last three Grand Slam wins were perfectly timed. Djokovic was physically restrained and nursing an elbow injury. But now that the Serb has returned to full fitness, the scenario has changed. The Serb has captured three Grand Slams and returned to the summit of men’s tennis. Federer, on the other side, has failed to replicate his stunning 2017 season. Djokovic’s return to World No.1 coincided with Federer’s alarming form during the second half of 2018. This begs the question whether Federer will ever win another Grand Slam. While it is understandable at this point not to count out the 20-time Grand Slam winner to have one more shot at Wimbledon or the US Open, it is also worth noting he is not getting any younger. That puts Djokovic in prime position to edge ever closer to No.20. The significance of Djokovic’s rout over Nadal was not just to put him closer to Nadal’s 17 Slams, but to chase history during the French Open in June. A lot will be at stake in Paris which is Nadal’s safe harbor. The Spaniard is the undisputed King of Clay with 11 titles on the Parisian dirt. However, Djokovic is a force to be reckoned with. He is the only active player to have beaten Nadal at Roland Garros. His game is also suited to all surfaces. His counter punch style from the backhand wing is probably the only antidote to Nadal's cross court forehand. Following his Australian Open win, Djokovic will attempt to hold all four Slams by winning the French Open in five months' time. Of course, that will be his toughest assignment against Nadal who has never lost in the final of the French Open. The Serbian star is playing with renewed confidence since his return from injury and he could complete the second career Grand Slam in the spring during the French Open. If he manages to dethrone Nadal, he will become the first man to win each Grand Slam at least twice. That achievement will only further elevate Djokovic’s status as a player for all surfaces, having already won Wimbledon four times. Djokovic could be in sight of Federer’s record if he wins in Paris. The Swiss has elected to play during the clay court season now that his record-haul of 20 titles is in serious jeopardy, but it would take a monumental effort to stop Djokovic, considering that Federer has not played the French Open since 2015. Perhaps the most significant reason why Djokovic will eventually beat Federer’s record is his age. Djokovic has advantage over his adversary being 31 (soon to turn 32), while Federer is 37 (soon to turn 38). That would mean that Federer has a few years left on the tour before hanging up his racket. Djokovic, meanwhile, could play at the top level for at least four years. The Serb first needs to pass Nadal who is on 17 Grand Slams before eyeing Federer. He explained during the post match press conference shortly after winning the Australian Open that Federer’s record is far, but he is motivated by the idea of eventually breaking it. But he was quick to reiterate that the focus is on improving his game and maintaining his well-being. Sometimes things can change. Injuries can happen out of the blue, or an opponent can play lights out tennis in a final. Djokovic has had to contend with that. He now seems to have regained his status not only of the best player in the world, but of tennis’ most dominant man. The tennis season is one of the most grueling of any sport and there will be momentum shifts during the year, upsets, and some eyebrow-raising results. However, if there is one thing we have learnt from this Australian Open then it is that Novak Djokovic will be the man to beat in 2019.